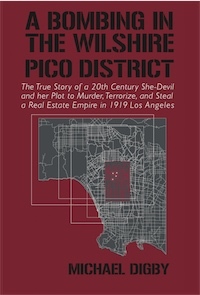 This is the story of a nascent band of amateur bombers, arsonists and thugs who attempted to murder, terrorize and steal a real estate fortune in 1919 Los Angeles. A campaign of terrorist and anarchist bombings gripped the United States throughout the first two decades of the 20th Century. There were hundreds of bombings committed by extremist elements within the American labor movement, Italian anarchists, Sicilian mobsters, German saboteurs, ‘Red’ agitators, street thugs and lunatics all with an axe to grind and a willingness to use explosives and terror to advance their cause. Amidst this chaos, a nascent group of amateurs embarked on their own city-wide campaign of terror – committing murder and sabotage, assaulting, threatening and blackmailing witnesses, setting fire to a church and a private home before blowing up the home of a prominent Los Angeles attorney. What follows is a 1919 Los Angeles story. It is the story of a shrewd and conniving woman with a seemingly powerful ‘little black book’ who would stop at nothing to steal her murdered husbands real estate empire, a woman who set out to avenge the loss of that fortune and the story of her fawning ‘gentlemen suitors’, all willing to do anything for her, to include committing murder and suicide. It is also the story of the lawmen who exposed this brazen conspiracy of murder, arson and bombing and the political cover-up that followed. A history of criminal and terrorist bombs in Los Angeles. The author served seven years in the United States Army and 34 with the Los Angeles County Sheriff's Department - the majority of that time as a bomb technician and detective assigned to the Bomb Squad. He is somewhat retired but continues to provide bomb training around the country. This is his second book.